One of the breakout games of 2017 was Hellblade: Senua’s Sacrifice, a Ninja Theory title that was recently released into the wilds of Xbox One 4K glory. It’s gorgeous and deep, and it’s got the chops to back that up: it also just won a stunning five BAFTA Awards. Of course, these come on the tail of Hellblade’s storied adventure, where the game has garnered fifty-four gaming nominations and wins. In short? It’s a damned good game. Taking the reins of Senua, a Celtic warrior on the road to redemption, you navigate the worlds of Norse mythology, ultimately headed for Helheim- where your lover’s soul supposedly awaits a savior. The caveat: Senua suffers from severe psychosis. Voice after voice after voice fill her (and in turn, the player) with dread, confusion, and doubt. If you’ve got a good gaming headset, use it for this game. Surround sound systems just don’t do it justice. I promise you won’t be disappointed. The sound engineering for Hellblade is top notch; using binaural microphones for all their recording, the voices come from every direction, leading an assault on Senua’s senses. She struggles to keep her sanity, often staving off false realities and trying to break through her hallucinations. Which ones are real? Which ones are fake? There’s no way to know until it’s over. Ninja Theory really did their homework in creating this rocking boat of reality; after initial developments, they brought in psychosis expert (and neuroscientist) Paul Fletcher, who helped keep them on track. The company also had numerous mental health testimonies to back their ideas up, which made for an ultra-realistic experience. Another thumbs up for Ninja Theory: they’ve worked hard to donate chunks of their proceeds to numerous Mental Health programs. Death is not simply a “Game Over” screen in Hellblade. As it’s explained in the game, death brings a consequence: the darkness that lives in Senua will spread every time you die, until there’s nothing left of her… or your game save. That’s right: the looming fear of death threatens your entire journey, and if you die too much, it’s actually Game Over. This ramps up the nervousness of the game (as if that aspect needed help!) and spurs you to do better and better as you fight through waves of enemies on your path to Helheim. Along the way, you’ll learn bits of Norse mythology, all told by someone you once called friend- Druth, a Celtic man who sacrificed everything in hopes of not meeting a grisly fate. There are puzzles, boss fights, and visions to contend with along your journey, and this is where my only gripe comes in with Hellblade. Enemies are often duplicates. You’ll encounter a few different types, but once you hit those three or four, that’s all you’ll ever see. Don’t get me wrong, some of them are obnoxious as Hel (teehee), but they get old. The levels and boss fights, however, are clever and engaging. In order to break through the gates of Helheim, you must defeat two of Hela’s gatekeepers. Valravn, touted as the tricky raven god of illusion, will leave you scratching your head as you weave your way through multiple gateways in search of a path to him. Once you do get to him, brace yourself: he’s fast, and hits like a runaway train. The second is Surtr, a fire giant of the Nine Realms. Yes, if you’ve watched Thor: Ragnarok, it’s that Surtr. Surtr is a warrior who hits hard, and has the convenient ability to ignite himself, harming Senua every time she attacks. Hellblade: Senua’s Sacrifice is a monumental step for representation of mental illness in gaming media. 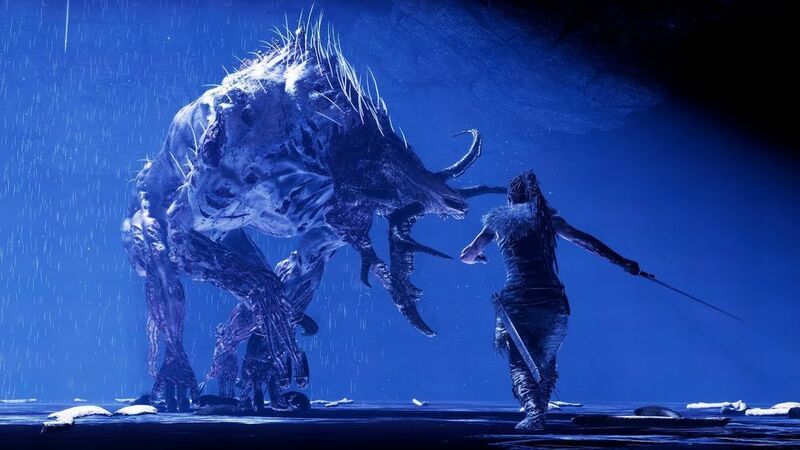 With its recent graphical upgrade, the story is even more beautiful and visceral than before, and with its widened platform base, players on both sides of the console wars can take part in Senua’s descent-- and hopeful rise-- from madness.